Precast concrete elements made of a sophisticated concrete mixture were used up in building of the so-called “Zölly” high-rise in Zurich. 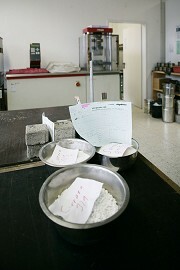 The addition of chemical additives enabled the application of an as low-slump as possible and thus lean concrete for the production of the high-quality components. „The days are over when we just chose a concrete mixture from our list of formulations for a project!" Dr.-Ing. José Colan waves aside. „On the contrary, every project brings about completely new challenges concerning the composition. For the Zölly high-rise, the architects requested for aggregates composed of marble as well as a bright sand. An Italian supplier could be found to deliver this material mix - the company Ferrari located in Grezzana near Verona," comments the plant manager at Nägelebau GmbH, a manufacturer of precast concrete elements based in the Austrian municipality of Röthis. In order to obtain a concrete featuring the viscosity specified, the manufacturer used the plasticizer Glenium ACE 331 of BASF Construction Chemicals. This product primarily consists of polycarboxylates allowing a reduction of the mixing water. The manufacturer o1 precast elements is often using the concrete admixture because it enables him to produce a very lean concrete with an even denser material structure. As a result, even in a powerful compaction process by means of a vibrating table, the still liquid concrete does not ooze out of the formwork which basically leads to dimensional accuracy. 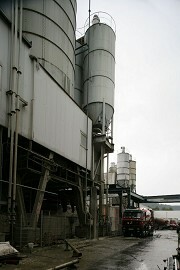 Micro- Air is another additive of the same supplier that is used by Nägelebau. This concrete admixture provides for particularly small micro air voids which are able to absorb moisture excellently und to store it without damaging the material. They have advantages both in case of atmospheric moisture occurring externally such as driving rain and an excess moisture in the building component. On the one hand, they control the evacuation of moisture to the outside. However, the micro voids store water too if the surface is closed, for instance, by frost und thus became temporarily impermeable. Then, the water can freeze in the voids expanding there without causing damages. The dangerous frost splittings will not occur. Ultimately, these micro voids were the reason for the fact that precast concrete elements could be used in building in an entirely untreated state. Although the elements may be stained heavily as a result of the construction site activities, this will not cause a structural damage and can be cleaned afterwards. They were spraying very precisely on a concrete wall where the sections that should remain „smooth" were covered with the aid of face molds. 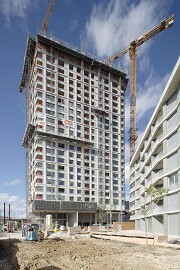 Both the concrete surfaces roughened by means of sandblasting and the untreated ones, even remained otherwise completely untreated until after the assembly at the Zölly high-rise construction site in Zurich, because the concrete components will only be permanently treated with a hydrophobic agent after the completion of all construction works. This is due to the erection scaffolds which are growing together with the building at the construction site and leave unavoidable dirt stains starting from the wall anchor points. The hydrophobic treatment makes only sense after dismounting of all scaffolds and an extensive cleaning of all façade elements. Along with the growing number of stories, the scaffolds around the building also climbed up. However, all façade areas completed remained accessible via the elongated external elevators following each other precisely. A chemical technician of Nägelebau was responsible for washing the mentioned soilings and stains off using Rheofinish Ex, a phosphoric acid product made by BASF Construction Chemicals for acid-washing. The corrosive chemical can be well applied in the open air as it does not tend to evaporate excessively - in particular at lower temperatures. However, the skills of the concrete technician are needed here. As the acid may only react for a short while on the completely untreated concrete surface, he has to start quickly to neutralize it again with water. Whereas he can let it take effect for a longer period on the sandblasted sections, because the haptic effect is similar in the end. The profundity of effects can be controlled by the residence time or by the concentration. Dependent on the manufacturing process, there is generally a smaller amount of aggregates in outer parts of the hardened cement paste than more inside. 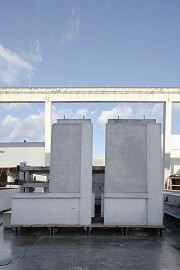 The hardened cement is removed when etching or sandblasting as far as the so-called canopy structure has been reached. This also explains the noticeable offset between the treated and untreated sections. Furthermore, the cement residues of the aggregates exposed after sandblasting are washed off in the acid-washing process which has the rough surface appear in an even more sculptural way. The times when concrete was allowed a period of 21 days for hardening are gone meanwhile, in particular in precast concrete construction. Usually, the precast concrete elements have one night to harden in a heated curing chamber and then the formwork is removed at the following day in order to treat the surface directly. This is not possible without the appropriate additives and admixtures ensuring an optimum pore size, a perfect rheological behaviour or a uniform acid resistance of the cast stone. Actually, they make certain projects possible at all, like these homogeneous precast elements with two different surfaces, for example.